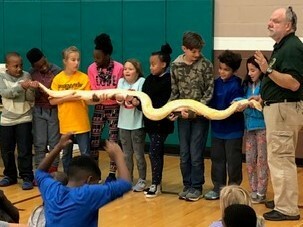 Greenview Upper Elementary students recently enjoyed a special presentation featuring live reptiles from The Herps Alive Foundation on Halloween. The assembly not only provided students a chance to learn more about the various reptiles’ physical characteristics and habitats, but also get an up and close look at several species who currently live at the foundation. A group of brave fourth graders assumed the challenge of holding up an extremely large snake during the presentation! Located in South Euclid, Herps Alive is a non-profit foundation dedicated to rehabbing and offering up for adoption reptiles who have been abused or neglected. The organization also provides educational programs and guided tours of its facility. Overall, the Halloween assembly was a fun and exciting time that students and staff will certainly not soon forget!